This is great for the person who’s a true fan for their school or team. Make them feel that they are the teams #1 fan! With the fresh grass scent, it will be like they were part of the team. Weigh 1 oz. of Ultra White and place in small plastic beaker. Heat in microwave at 10 second intervals until melted. In a small bowl, gently mix 1 teaspoon Liquid Glycerin with 1/4 teaspoon of first powder color (Neon Laser Lemon Powder). Using a mini-mixer or frother will help blend the powder into the liquid. Add mixed color to 1 oz. melted Ultra White Soap. 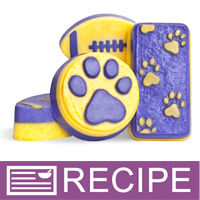 Using a plastic dropper, place colored soap in paw prints and football laces of molds. Spritz with alcohol to dissolve bubbles. Allow the soap to harden. To keep dropper flowing freely, place in warm water when not in use. Before using again, be sure to empty water from the dropper. Weigh 18 oz. of Ultra White Soap. Cut up into chunks and place in glass measuring cup. Heat in microwave until soap has completely melted. In a separate bowl, mix 1 oz. Liquid Glycerin with 1 1/2 teaspoons of second color (Neon Bunch Berry Purple Powder). Use mini-mixer to help incorporate powder. Add mixed color to 18 oz. melted Ultra White Soap. Add 16 ml. fragrance and stir to mix well. Spritz inside of each soap cavity generously with alcohol. This ensures the overpour will stick to the last soap layer poured. 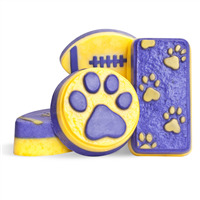 Pour soap evenly between all paw print and football cavities filling each cavity to the top. Allow soap to harden completely. Package and enjoy. If purchasing the soap kit, we have included extra powder colors to match your school/team. *NOTE: Neon Powder dyes can speckle if too dark/too much color is used.